Willem de Fesch came from northern part of Holland where he performed as viola da gamba player. Afterwards he was employed as bandmaster in Antwerp minster but due to his eruptive temper and mistreating of inferior singers, Fesch had to get away to England. 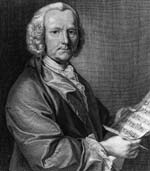 There he became rather successful, both by his vocal compositions and as lead violinist in Handel´s orchest-ra, too. His entire work represents the development of music leading from virtuoso style towards stylish chastity and profundity. ra, too. His entire work represents the development of music leading from virtuoso style towards stylish c chastity and profundity.